When something is needed, it is purchased. In companies, this process usually consists of several phases and many individual steps, which can be very different. Only a few of them are optimally reproduced in standard SAP® systems. With EASY PCM products, the entire procurement process is continuously supported and is completely integrated into your SAP® landscape – from the purchase requisition to the receipt and comparison of offers and the order to the reception of goods and invoices. We refine and improve SAP® Procurement – with that special EASY touch. At the start of the purchasing process, EASY purchasing management supports two different scenarios which may be found in companies for different order categories. 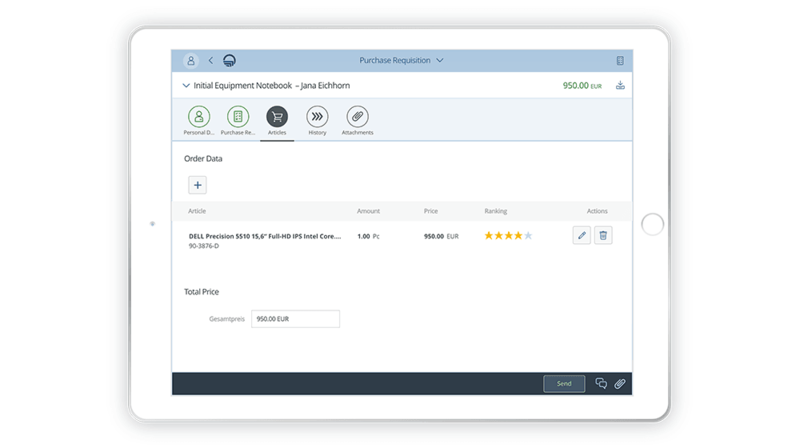 The purchasing management in SAP® begins either with the initial, manually triggered purchase requisition or through purchase requisitions automatically created by upstream processes, such as a planning run. While the purchase requisitions in the first case are usually poorly structured, those in the second case often stand out because they require extensive authorization processes for approval. Efficient handling of all purchasing processes while complying with all necessary approval steps and content validations. Thanks to the bundling of different needs and a clear understanding of ongoing and planned purchasing processes, Purchasing is able to focus on relevant topics and put purchasing advantages into effect there. In the past, the acquisition of goods such as office materials, replacement parts, and many other product groups was often a time-consuming process. Thanks to linking with web shops, this process in purchasing management has been greatly simplified and purchases can be bundled with the desired suppliers. 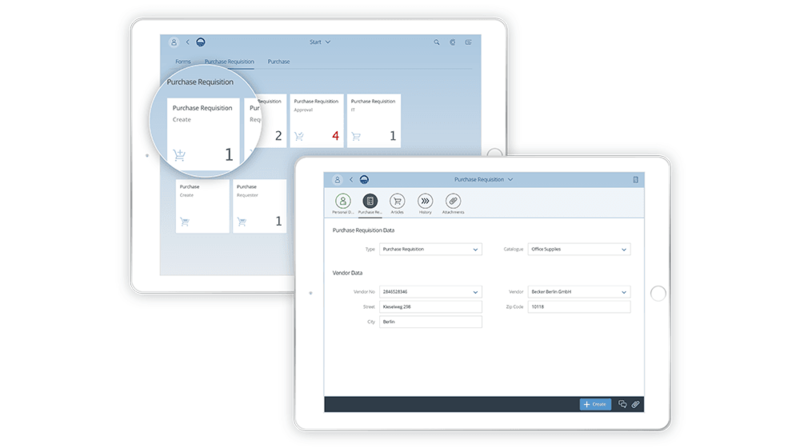 Integrated work in the accustomed environment and on mobile devices (SAP® Fiori®/HTML5) are part of the advantages of purchasing management in SAP® with PCM Purchase Requisition and PCM Order. SAP® purchase requisitions are generated automatically, for example by MRP run. Factual approval, for example taking into consideration alternative material planning scenarios or alternative technical solutions – even a MRP run is only as good as the data it considers. Commercial and legal approval: Orders in this environment can have significant orders of magnitude. By considering their approval guidelines, we ensure that all necessary signatures can be obtained promptly. That reduces cycle times in purchasing management through integrated processes. Is SAP® already used in your company? If you can answer that question with yes – wonderful, you have taken the first step towards a gain in efficiency. With our EASY PCM solution for SAP®, your purchasing management is on the threshold of the next gain in efficiency. This process particularly offers significant potential for optimization. Traditionally, purchasing management is frequently one of the paper-based processes – but if you rely on EASY PCM, you will learn to appreciate digital purchasing management and won’t want to do without EASY PCM Purchase Requisition and EASY PCM Order ever again. Set clear limits on maverick buying. With EASY PCM Purchasing Management for SAP®, EASY Purchase Requisition clearly documents which department wants which order. Just ordering without Purchasing is no longer possible. The ordering process is only initiated after the purchase requisition has been approved. Forget the “old” days when Purchasing was confronted on a daily basis with questions like these: Is there even a purchase requisition for the requested resource? Who decides on the verification and approval of the purchase requisition? Were the right goods selected for the order? In short, the order process demanded too much time. With EASY Purchase Requisition and EASY Order, this process runs automatically. Checkers and approvers are automatically notified and initiate the order process with the click of a mouse. With digital purchasing management, you gain the advantage of reducing purchasing process costs by up to 30 percent over the traditional method (according to a study: BME e.V.). With EASY Purchasing Management, orders now take place within the framework of negotiated contracts at better, set conditions. That pays off. Create purchase requisition with recipient and account assignment, because clean original data provide for efficient processes in the process flow. Select items to be ordered either via a link to one or more web shops or by selection of SAP® materials or free text. 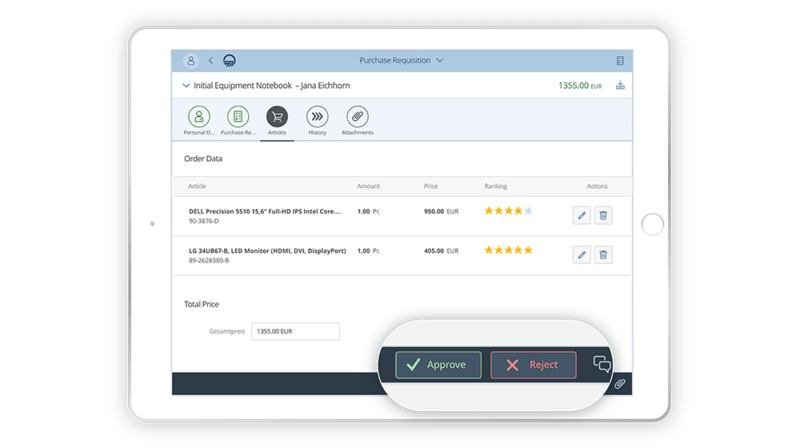 In order to accommodate a wide variety of order processes and to make things as easy as possible for the orderer in purchasing management – purchase like at home. Optional: Inclusion of departments, for example IT for the validation of IT purchases with regard to company standards and compatibility. Authorization and approval and subsequent automatic creation of the SAP® purchase requisition or SAP® order in purchasing management. The process status keeps everything visible, so that no purchase requisitions are left lying in a drawer.